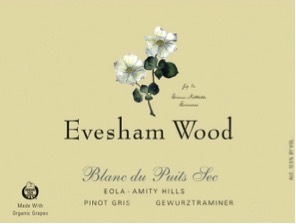 The Evesham Wood 2014 ‘Blanc de Puits Sec’ was a wine I had a preconceived notion about. When I looked at the label I fixated on it being a Gewurztraminer rather than the beautiful, dry Pinot Gris it is, or at least mostly is. In addition to the 85% Pinot Gris, there is about 15% Gewürztraminer and a smattering of Kerner, Rieslaner, Traminer and Pinot Blanc blended in. One deep smell of bright jasmine tea, roses and honeysuckle and I knew I was holding a winner. Blanc du Puits Sec, named after the dry well (Puits Sec) that sits in Erin and Jordan Nuccio’s 12.5 acre parcel, comes from the original vineyard planting in 1986 by original owner Russ Raney. The grapes are grown tightly-spaced and nestled on a low terrace on the eastern side of the Eola-Amity Hills ridge. It’s a beautiful non-irrigated organic wine pressed from whole clusters and fermented in stainless steel with an alluring nose of rose, spice, lychee and pear. Because I erroneously thought of Alsace and Gewurztraminer, my first thoughts on pairing ran more in that direction. One very important factor in food and wine pairing is to pay attention to the wine style in addition to the varietal. Pinot Gris’ are prime examples. Italian Pinot Grigio tend to have brighter acid and more of a Sauvignon Blanc style (without the grass), lending themselves to pair flawlessly with caprese salads and rich preparations of chicken and shellfish. New world styles tend to be spicier and more viscous and pair even better with rich dishes. The Blanc du Puits Sec falls somewhere between the Italian style and what is traditionally considered as the Oregon style. 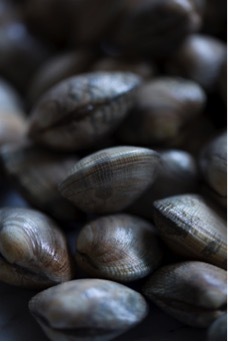 Because of that, it is a very versatile wine that will accompany a range of dishes from simple oysters or a simple tuna carpaccio to richer pasta dishes and even some less aggressively spiced Asian preparations. It is the perfect summer wine able to adapt to whatever you are cooking. 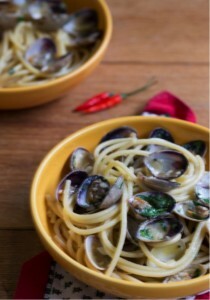 I settled on an enriched Pasta alle Vongole as the perfect match. 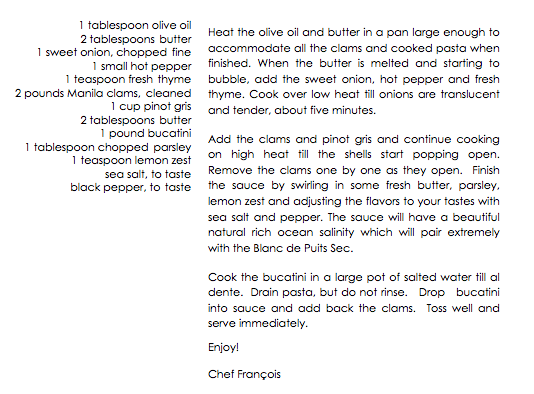 I used succulent Manila clams freshly dug by friends in Washington state tossed with rich butter, fragrant olive oil and pasta. This is a fantastic pairing. The cleaner style of the wine brought out the sweetness of Manila clams and complemented the hints of citrus found in the lemon zest. The wine got more of an intense pear flavor and a bigger mouth feel. Which proves my belief that food needs wine and wine needs food. GET YOUR BOTTLE (OR BOTTLES) OF EVESHAM WOOD PUITS SEC 2014 RIGHT HERE OR STOP BY IF YOU ARE LOCAL. Sign up today to get information on our special offers.